Fever-Bugz®, the kid friendly fever indicator, allows parents to continue monitoring the child’s temperature up to 48 hours, easily. The encapsulated liquid crystals technology of Fever-Bugz®, provides user’s body temperature in increases of 1°C, visible in seconds. 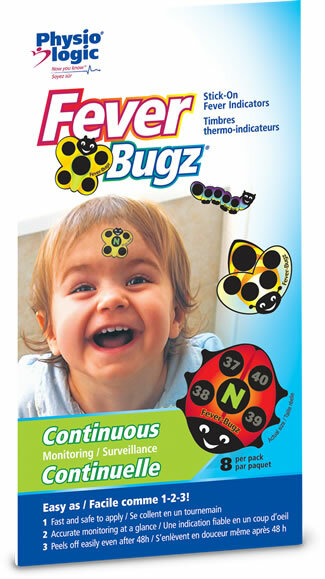 What’s more, Fever-Bugz® can be conveniently placed over armpit, forehead or chest. Hi there! Wanted to tell you about how much I like your awesome Fever Bugz! My sister had given me a package of Fever Bugz and I had forgotten them in the cupboard, but found them the other day. Wow, what an awesome tool! My younger daughter attends a preschool for the Deaf. Every working parent stresses over whether or not to send your kid to school when they've got the sniffles, but a fever is a definite decider to stay home. That's where the bug helped out perfectly! She LOVED having the ladybug on her forehead, and while the school staffers looked at me askance this morning, when I picked up my daughter in the afternoon, they were clearly impressed by the Bug, reporting back to me changes in temperature. They loved it! And I could feel reassured at work, knowing that if my daughter got sicker, the school would call me to pick her up! Working parents HATE to take time off work if the kids aren't "really sick" - you must market these as a tool for parents with small ones in daycare, or children with disabilities or communication disorders such as mine. What a boon! Thank you. What do you have to say on this product? More information on Physio Logic®.